What do you remember from your commute last night? About as unremarkable as the morning that preceded it, right? Tight on time but eager to hone his pictorial skills, Brum-based Kris Askey dispensed with the endless social media scroll which formerly occupied his journeys to and from work in favour of his camera for twelve whole months. Here is but a fun size portion of his favourite shots from the year. "Taking photos on my walks from work and Moor Street pushed me to keep shooting, even once I had jumped onto the train. I remember being completely fascinated with the idea of reﬂections overlapping people, and the fact that these kinds of things only happen once, very quickly. This man was listening to his music for at least two stops and looked really deep in thought. I remember liking the way the reﬂection of the lights crossed the man's expression and completed the scene." 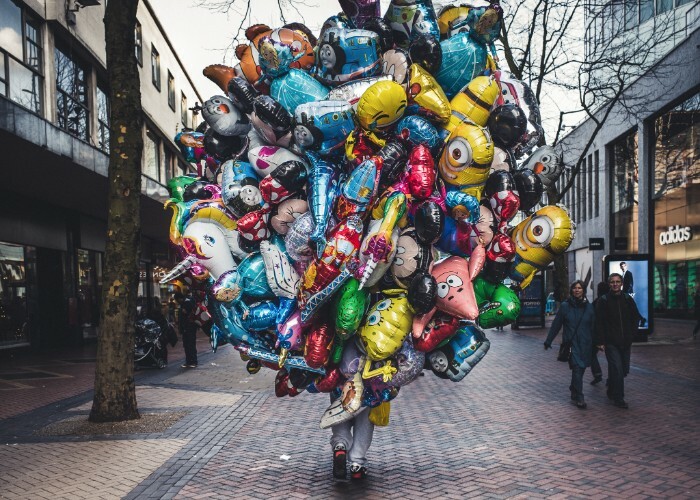 "It’s hard to miss a person holding an incredibly large collection of cartoon balloons, though I did struggle to capture an image that stood out. That was until the day I spied this collection ﬂoating slowly in different directions, seemingly with a pair of legs to anchor it. I particularly enjoy the reaction of the couple to the right of the image, as the inflatable menagerie just strolls on by." "I remember struggling to spot anything on this walk, that was until I reached where Corporation Street crosses New Street. 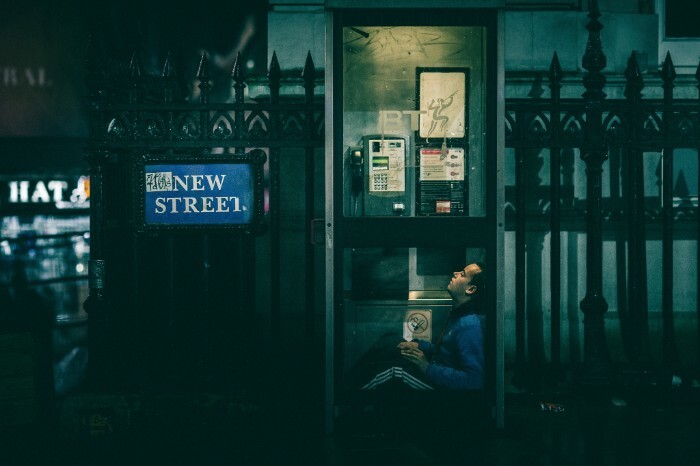 A man entered a phone box to shelter from the last part of a rain shower. He was only in there for about 60 seconds — nobody else seemed to notice him at all — but I managed to get this frame of him looking deep in thought, within the little structure, providing the only protection available. Shortly after, he got up and moved on. The moment came, and went just like that." 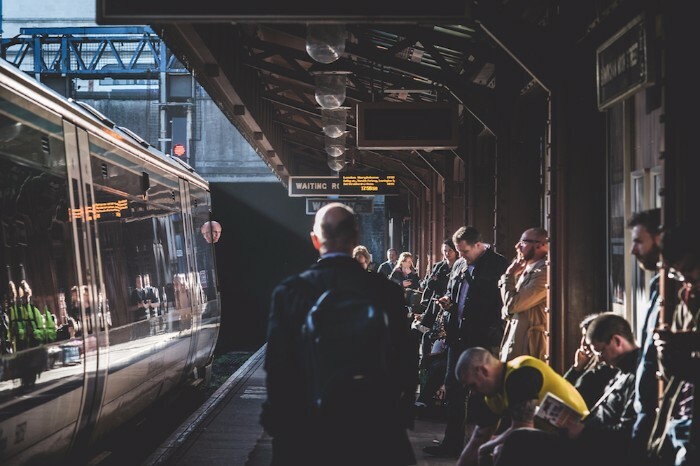 "The part of my commute where I spent a lot of time was inside Moor Street station. The place itself has as array of wonderful architecture which acts as a great backdrop for candid moments throughout the day. I remember on the afternoon pictured, there when sunbeams pouring off the top of the waiting carriage onto people passing along the platform. 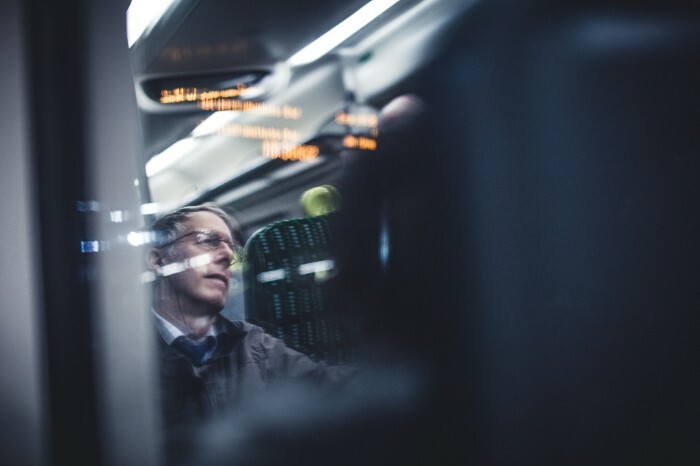 In this shot, I particularly like the train drivers head popping out, creating its own reflection onto the train." "Most of my inspiration comes from books full of black and white images taken in the 50s and 60s, and I have always been drawn to photography that displays emotion and sums up a scene in a single frame. 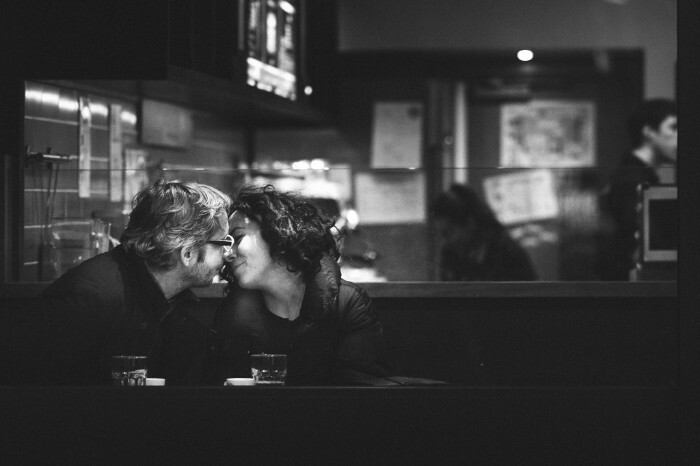 I took a photo of this couple in March in a cafe on New Street, around the time I was looking to ﬁnish up a whole year of shooting, and, it completes the collection perfectly. Documenting ‘real life’ almost gave me a new set of eyes, and a more clear understanding of what I wanted from photography. It allowed me to see the beauty in normal life. That’s the only way I can really describe it." Contact Kris to discuss prints and commissions, and maybe follow him on Instagram why don'cha?